Note: The spiral pattern will appear slightly imperfect at the end of the round; as the next round of the stitch pattern begins, there will be 7 k sts or 4 p sts in a row. Modifications: Pretty much everything was modified. 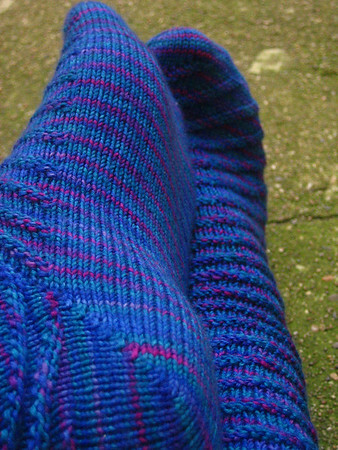 Knit toe up using magic cast on, increases were made so the toe sloped gently, stitch count was a multiple of 9 minus 1 for the left foot, multiple of 9 plus 1 for the right foot to allow for auto spiraling, short row heel with double wraps, knit one purl one sewn bind-off from Vogue Knitting. This entry was posted	on Sunday, March 11th, 2007 at 10:52	and is filed under knit. You can follow any responses to this entry through the RSS 2.0 feed. You can leave a response, or trackback from your own site.